Greet spring with this light and bright vegetarian dish. Cook pasta according to package directions; use kosher salt to season the pasta's cooking water. Preheat a large sauté pan and drizzle with olive oil. 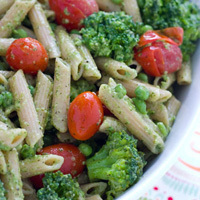 Add broccoli florets and cherry tomatoes. Cover with a lid and sauté over medium heat just until broccoli becomes a vibrant green and tomatoes start to burst. Add peas and heat through.